The Garston Empire on the corner of James Street and Church Street, Liverpool was built on the site of a the former Garston Hall which was a grange farm once held by the Benedictine Monks of the Priory of St.Thomas the Martyr of UpHolland, of which more information can be found here. The Hall was demolished in the 1880s. 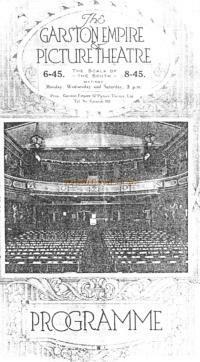 Right - A Programme cover for the Garston Empire showing the auditorium from the stage in 1919 - Courtesy The Garston and District Historical Society. A planning application to build a new Theatre on the site of Garston Hall was first submitted on the 12th of November 1912 but was not permitted which led Mr. Thomas George Carroll to submit a new application the following year on January the 7th. This revised plan to build a Theatre on the site was estimated at £6,000 and was approved but, perhaps because the funds were not forthcoming, the plan never went ahead. Yet another plan was then submitted in July the same year, this time by the Garston Empire & Picture Theatre Company and designed by Joseph Pearce. The new Theatre was to be built on two levels, Stalls and Pit, and Circle with two stage boxes and seating for over 1,100 people. 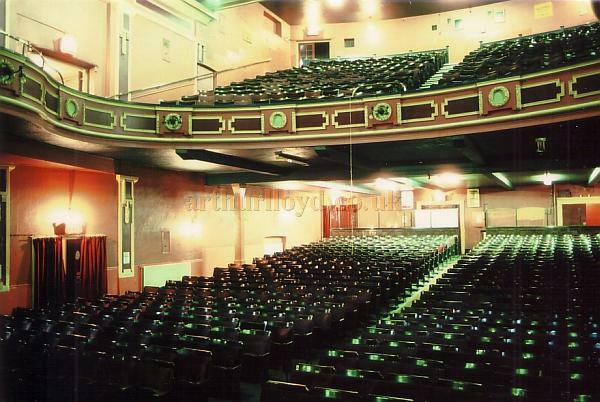 The Theatre was also designed with eight dressing room and a biograph box for the showing of films in the Theatre. The plan was accepted but again building work did not go ahead. For a while it seemed that Garston was not going to get its new Theatre but in 1914 Alfred Wright, of Walton Park, who was produce broker, submitted a new plan for the building of a Theatre on the site which was to cost £7,500. The plans were approved, finances were at last assured and building work by R. Costain & Sons began. 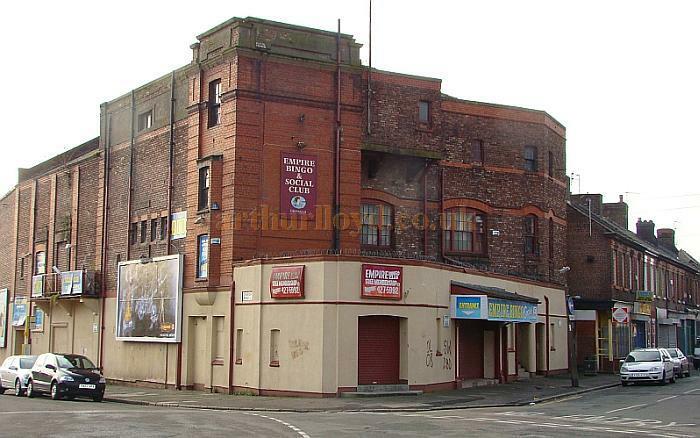 The Garston Empire received its first license for Theatre, Music Hall, and Cinematograph on the 1st of June the following year, 1915, and building work was completed on the 30th of June. Finally Garston had its new Theatre. The newly built Theatre had seating for 815 people on two levels, Stalls and Circle, a stage of just 15 foot deep, and seven dressing rooms for the artistes that it hoped to attract. Variety and Music Hall were the main entertainment on offer but right from the start it was also showing early films too. Despite being host to some top name stars such as Gracie Fields and Tommy Handley however, the Theatre was to have a short life as a live Variety Theatre. By 1918, only three years after the Garston Empire opened, live theatre ceased and the Theatre was in use only as a Cinema, with a diet of silent films. One of the shows presented at the Garston Empire before its conversion to Cinema was Archie Pitt's "It's a Bargain" a revue with the then young Gracie fields, which was the forerunner of the better known, "Mr Tower of London". The week before the Garston engagement the revue was at the Victoria theatre, West Stanley, where they played to very poor business and the cast had to wait at the station until Archie Pitt and his brother Bert were able to borrow enough money to take the revue to the Garston Empire. In 1930 the Theatre was converted for the 'Talkies' and the first film shown in the new format was 'Gold Diggers of Broadway' which must have been something of a revelation to the Empire's regulars who were used to seeing films accompanied by a piano. As a Cinema the Garston Empire was a lot more successful and continued showing films for 40 years but even this success couldn't last for ever and after the showing of Elvis Presley's 'Jailhouse Rock' in 1962 the Cinema closed its doors for the last time and the building was converted for Bingo. 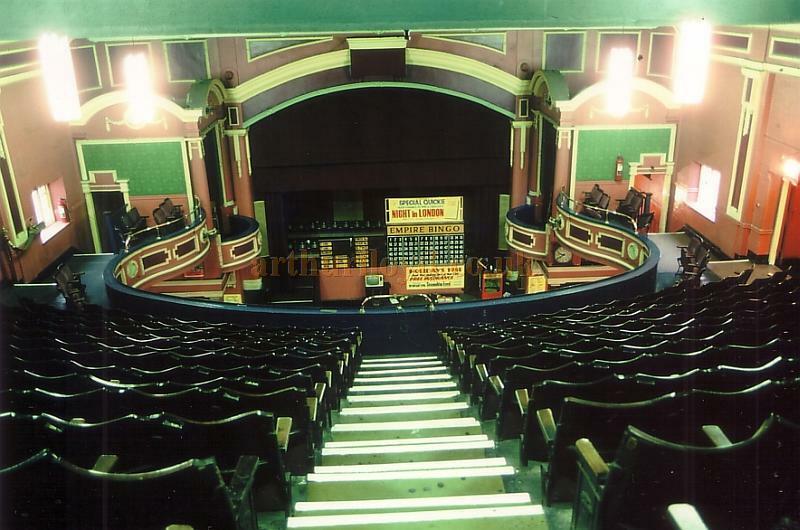 Above - The Stage and auditorium boxes of the Garston Empire, Liverpool whilst being run by Empire Bingo in 1981 - Courtesy Ted Bottle. 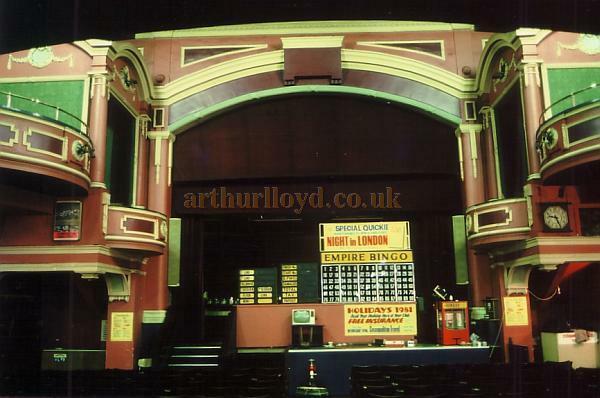 And it's thanks to Bingo that the Theatre is still standing today, many Theatres around the Country were not so fortunate. Bingo continues to this day. The stage of the Theatre remains but underneath it a bar has been built into the space which is reached from the stalls via the former Orchestra Pit which has now had its front removed. Above - The Stage and auditorium from the Circle of the Garston Empire, Liverpool whilst being run by Empire Bingo in 1981 - Courtesy Ted Bottle. Some of the information on this page, on the history of the Garston Empire, was kindly supplied by the Garston and District Historical Society, and Alan Chudley.